In January, we're starting our first ever BoBunny Online Class on the blog! See below for details and a shopping list. 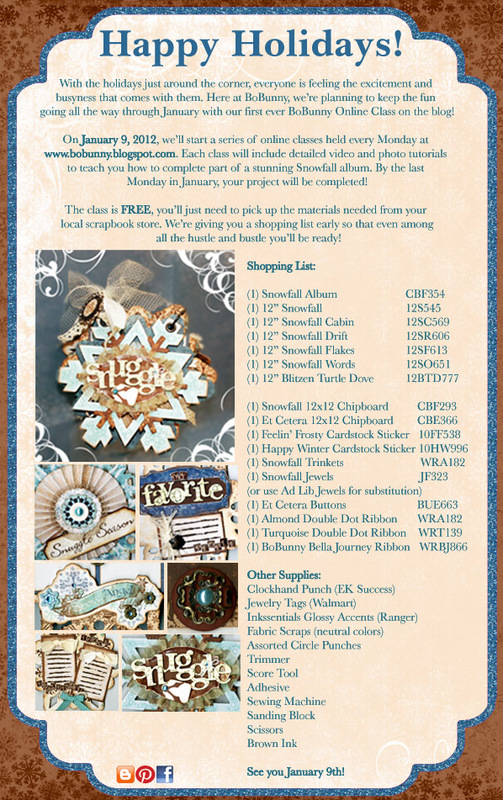 You won't want to miss out on this stunning Snowfall album! ooohhhhh.....can't wait! Thanks for doing this :) The album looks beautiful! Thank you so much! My LSS has been closed for a year now, and I miss the classes! I can't wait for January 9th! I LOVE this idea! It looks beautiful ,too bad our Christmases here are hot and dry! But I will love to see what is the next class! I have the papers! So excited to be guided using them. Brilliant I am virtually housebound and cant get to classes so will have a go to classes. We can't get the supplies easily so will make mine as best I can. I wish my stores were not out of this product. I didn't get to purchase these items before Christmas when they came out. It seems like they order the product once and when they are out, they don't reorder. I have just bought this paper. Can't wait!